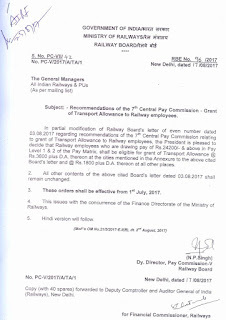 Subject: – Recommendations of the 7th Central Pay Commission – Grant of Transport Allowance to Railway employees. 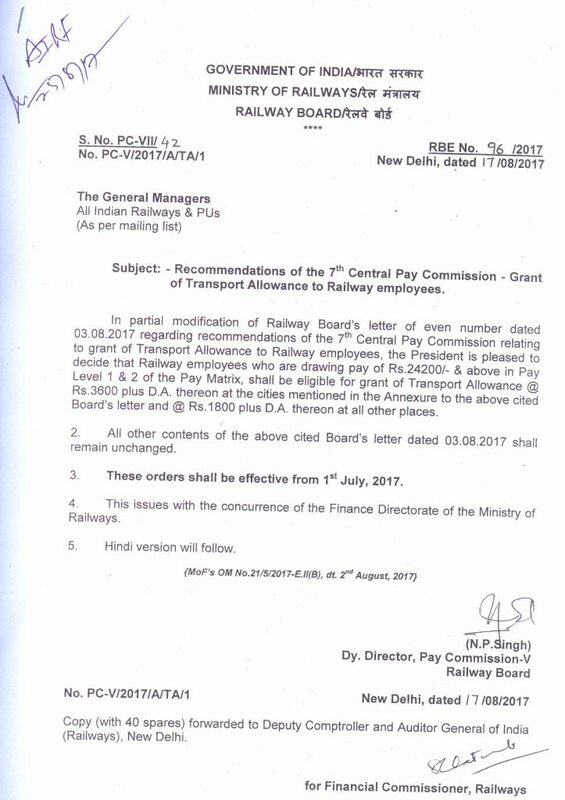 ln partial modification of Railway Board’s letter of even number dated 03.08.2017 regarding recommendations of the 7th Central Pay Commission relating to grant of Transport Allowance to Railway employees, the President is pleased to decide that Railway employees who are drawing pay of Rs.24200/- & above in Pay Level 1 & 2 of the Pay Matrix, shall be eligible for grant of Transport Allowance @ Rs.3600 plus D.A. thereon at the cities mentioned in the Annexure to the above cited Board’s letter and @ Rs.1800 plus D.A. thereon at all other places. 2. All other contents of the above cited Board’s letter dated 03.08.2017 shall remain unchanged.